Poultry India show is the biggest networking event in Indian subcontinent where key and strategic customers, opinion leaders, decision makers and government policy makers merge to exchange ideas. Organised at HITEX Center, Hyderabad from 28 to 30 Nov, Poultry India 2018 was a great opportunity for Ceva Polchem to display successful post-launch results of Transmune IBD in May 2018. The summit also presented an opportunity to launch Vectormune ND to complete Ceva’s unique package for hatchery vaccination. Thanks to a strong traction from Ceva Polchem team, over 220 delegates attended the program at Novotel Convention Center. 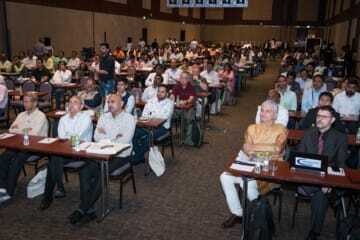 The audience predominantly comprised of field veterinarians, senior consultants and key clients. After a traditional lamp lighting ceremony, Stephane Bordier delivered a welcome speech. He appreciated our customers for showing confidence in Transmune IBD and reiterated Ceva’s commitment to deliver value through differentiated products and technical services. Technical presentation by Marcelo Paniago on New Castle disease control employing next generation vaccine Vectormune ND, offered a new insight to audience on control of all forms of ND (including genotype XIII) through a single hatchery vaccine. Jessica Lee presented most recent facts & figures on IBD control in India during 2018 after introduction of Transmune IBD hatchery vaccination. Both speakers generated a lot of interest among delegates by emphasizing the measurable improvement brought about by new technology hatchery vaccination. 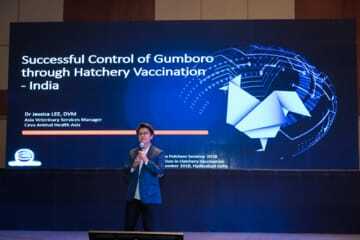 Towards the end, Mr. Sarot Srisod from Thailand showcased the unique hatchery innovations from Ceva for improvement in day old chick quality with LaserLife and Ovo-Sense Technologies. The summit provided a rare opportunity for delegates to interact with Ceva experts to gain more information and knowledge about recent trends in animal health management, disease challenges and effective solutions that Ceva offers to Indian poultry industry.